Identification with the mind is a scary place to live. Are you your thoughts? When we believe we are that bundle of racing thoughts and judgments inside our heads we are truly taken for a ride. It’s a version of insanity. Does this sound familiar? I promise you I go there a few times a week. It could be a bad audition that sends me into a spiral. Maybe it’s a doctor’s appointment or new ache or pain in my belly. Suddenly my world is crashing and I begin to imagine the worst possible outcomes. My point is the mind is powerful and it does not take long to spin out of control. Let’s put you back in the driver’s seat. Last week I had a conversation with my friend Sally, in which she was physically and emotionally distraught over the possible outcome of a pending legal dispute with her current landlord. In short, the landlord had failed to properly remediate mold from a bathroom ceiling. The management companies’ idea of fixing the situation was covering up the mess with new drywall. If you know anything about toxic mold it can be deadly and cause a lifetime of health issues. Especially if you lack the detox pathways to clear the toxins from your system. There is a proper way to deal with mold which includes but is not limited to; heat treatment, removal of the spores, air purification and demolition of all contaminated building supplies. This is all followed by a retesting of the air quality for further contamination. 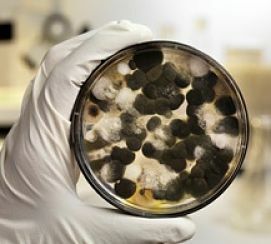 Click here if you’re looking for more information on mold, mold testing, and the genetic predisposition to its powers, this website has done the heavy lifting. Click Here for toxic mold testing. The landlord’s response to Sally’s request to repair the bathroom correctly was met with an aggressive threat to kick her out of her home. If you know what it’s like to find a place to live in NYC in the current real estate market, then you know this is not the news you were waiting for. It’s not helpful, it’s hurtful. The financial burden is real. These costs include first and last months rent, brokers fee, movers, and security deposit. You are looking at around 8K, minimum investment. Fun Fact: The average rent for a two-bedroom apartment in Manhattan is $3,895, according to the January 2015 Citi habitat market report. For the record: that’s roughly equal to the entire monthly income of the typical U.S. worker. I had encouraged Sally to pursue this legally even if she left the unit. Who would move into this space? Maybe it’s a new family with a young child? Maybe it’s an elderly couple expecting a safe place to dwell in their later years on the Upper East Side? Either scenario ends badly for all parties involved. As the person with access to information about the apartments hidden treasures, she had a responsibility, which was thrust upon her. Just like Spiderman. A never-ending landscape of “what if’s” swirled through Sally’s head. The complicated process and time constraints alone were pushing her towards a nervous system collapse. A loss in court, the struggle to find a new home, loss of money, financial instability and the blow to the ego of losing the battle. Remember to the ego, being wrong or losing an argument is the same as dying. (This is why we don’t want Donald Trump for president.) Thrown on the top of the pile is a legal system driven by $$ and antiquated procedure. The fear is real, justified, YUGE! The problem and why Sally was having such a hard time coping was her mind. She was leaning into the future. None of these outcomes were real or had come into existence yet. When we believe we are our thoughts we are ruled by them. We are taken out of the present moment of existence. Our thoughts become real physical and emotional pain. Ouch. You are walking down a hallway in Ripley Grier Studios, a popular New York City audition center. You pass by a practice room with the door ajar, full production grade performance exploding from inside. You have come upon a young lady “screlting” Macavity from CATS which she’s arranged into a higher and unattainable new key. The sound is intense, ridding just sharp on the scale for a majority of the chorus. It’s the same intense tone that makes your left ear drive towards the corresponding shoulder in an effort to bend the pitch and change the principles of sound already birthed from its source. Feel the strong natural impulse to wave your hands, make faces of confusion and scowl. Its as if these actions are going to change the nature of the noises existence or make it stop. You can fight the inevitable sound with body contortions and angst, or you can surrender to the moment. This is really happening. Simply let the sound pass through you, as I can assure from a scientific standpoint that is what’s happening. It is in this example how we can see we make our own pain. This is pain we have created for ourselves. We are waiting for it to be over or wishing for the past when it did not exist. Each is a clever attempt to escape what is. What our ego would love to do is control the sound, control the outside world, and make it bend to our every whim. Don’t wait around for this to happen, unless you are possessing X-men like powers. The power we do have exists in present moment awareness. You do have the power to control your thoughts and in turn your reactions. In the “now” there is no fear. Anxiety exists in the future of what may be, or fear exists in the past of something that has already happened. Neither is real or has power in the present moment. The only way to handle such difficult choices is surrender to the moment. This is really happening. I am entering a legal procedure in an attempt to find justice. The outcome is irrelevant. This does not mean resigning to being kicked out of your home or resigning to the fact that you will be taken advantage of. This means seeing the battle. Applying the energy and effort to fight for your truth and move forward from where you are at now. When you take “positive” action in alignment with your truth, even if the outcome is not the one you wished for, it strengthens your soul. When you continue to show up in life in this nature, it’s going to be an amazing 100 years. See what I did there? You did win. Karmic powers. The universe will reward you for this behavior and it’s easier than fighting reality. To close: We have to accept the fact that the things we love will leave our lives. It may be a home, a car, a loved one, a pile of money, or our favorite pair of sweatpants. Obviously, some of these are easier to let go of than others. It doesn’t mean don’t fight for something, but when you see the signs that it’s time to release your grip, do so. You never know what will take its place. This concept of holding onto things sounds simple, right? But what if we didn’t let go of the food we ate? What if we ate out at amazing restaurants every night for a week. What if we liked the food so much that we never wanted to get rid of it? We would get incredibly full and terribly constipated!! !Terribly constipated! It’s the same with material things and money. Let it come into your life and let it leave. In this way you will ensure more is on its way, allow life to flow as it wants to, fighting it only makes you spiritually constipated for weeks. And I don’t know a worse feeling than that. Oh…and my friend won her day in court. The Landlord has 30 days to repair the damage. ← Orange is the New Me: My time in jail. What I thought was going to be about toxic mold actually ended up to be much more. I could relate to the “taking positive action to strengthen my soul”. Your blogs always provoke me to reflect on my inner self. Keep on writing Freddie. Oh, and of course, I love listening to your voice! When I first began listening to the mold blog I felt like I was at a Tony Robbins or Depak Chopra seminar but something wasn’t quite right. Then I realized it was the voice, it’s like the first time you hear Roy Orbison its like a voice from outer space, you can’t not listen to it. I was pinned down by a strange psychic and hypnotic force. After I had listened to it ten or fifteen times I began to feel my old self coming back. I thought it was about mold and it was but more it was about mindfulness and attention and attitude. It didn’t change my life but I think it will help me stay off the stuff for one more day. Thanks, Thomas your enthusiasm and insight are always profound!